The introductory CLP piano, affordable and loaded with features. 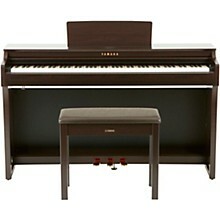 The CLP-625 is an ideal first piano for beginners or as a home piano for experienced players. It is the entry-level Clavinova, but offers qualities that even the most discriminating piano players will appreciate. At its heart are meticulously sampled Yamaha CFX and Bösendorfer Imperial pianos along with Yamaha’s widely acclaimed Graded Hammer 3X (GH3X) keyboard action with escapement feel. Binaural CFX Sampling technology delivers a three-dimensional sound that creates the perspective of the player position through headphones. Key-off samples deliver the delicate change in sound the instant the damper falls back to the string, and String Resonance recreates the sympathetic sounds of other strings resonating, emulating to a fine detail the behavior of acoustic pianos. Damper Resonance DSP recreates the sound of the inside of a grand piano when the dampers are off the strings. The combined effect of all of these nuances of the piano samples creates an extraordinarily satisfying musical experience. Stereophonic Optimizer adjusts the spatial distribution of sound in the listener's headphones, creating the sensation that sound is coming directly from the piano, rather than from the headphones. The USB TO HOST port allows players to connect to and interact with a wide variety of educational, creative and entertaining musical applications on a computer or mobile device. Be sure to check out the complete selection of Yamaha Clavinova Digital Pianos available at Musician's Friend. 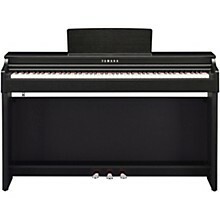 Affordable and satisfying, an ideal home piano.